Have you ever watched Win Butler’s appearances at the NBA Celebrity All-Star Game? What a bizarrely incongruous thing for the frontman of the most successful indie rock band of the 21st century to do, bobbing around the court with diminutive comedians and lesser Cabinet members. Butler, who actually won the MVP one year, comes off like a particularly domineering player. He calls for the ball when he’s way out of position, forces passes even LeBron James might call a stretch, takes ill-advised shots with the shamelessness of caffeinated Xbox teens. He doesn’t look like much fun to play with, even before you factor in the urban legends of him literally stealing the ball off the court. Arcade Fire aren’t much fun these days, either. Their new record, Everything Now, is particularly bad, cementing their status as a band who used to be good—“I only like the early stuff, really”—before the members have even hit middle-age. 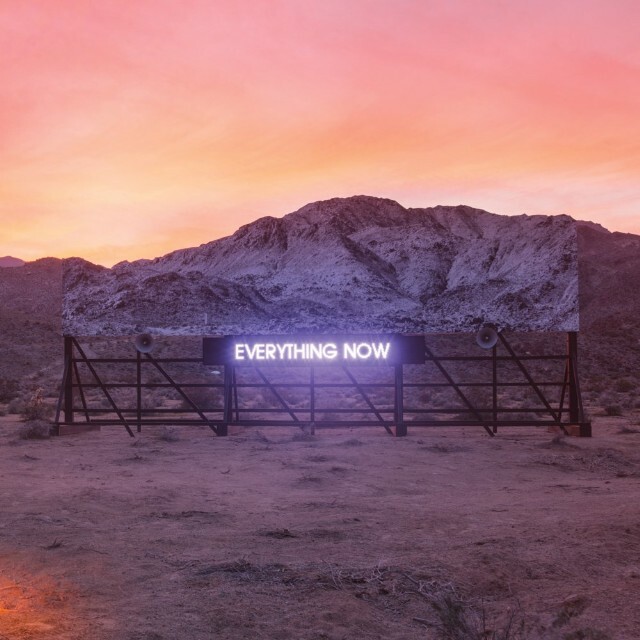 Once, Arcade Fire were the natural successors to U2, purveyors of ultra-earnest stadium rock whose buoyant melodies were undergirded by resonant mantras about seeking meaning in this cruel, callous world. Wake up! they chanted, backed by a million millennial whoops. Now, they’ve traded in their guitars for synthesizers, replaced starry-eyed sentiments with cynical jeremiads. They’ve become the worst kind of celebrity artist, finger-pointers blaming the kids and the corporations and the websites—everyone but the band itself, who sit up high with the haughtiness of a message board moderator. What might be worse than contentment? For many, contentment is a salve against the dreariness of everyday life, and might be found through a million mundane little things—a meal with a loved one, an episode of a TV show in which one has some investment. Arcade Fire sought contentment at one point. “I want a daughter while I’m still young,” Butler sang on The Suburbs, recorded back when they still had some use for guitars. Butler now has a son, whose ameliorating influence on this record is non-existent, and his rejection of these former aspirations sounds inherently antagonistic, summed up in the dreariness of another song title: We don’t deserve love. It’s a truly tricky thing to lecture the festival-going set for seeking the pleasures you’ve historically provided them without sounding like a giant, hypocritical dingus. The sourness of their newfound perspective might be one thing if the music sounded any good, but doesn’t. Arcade Fire have re-committed to running away from their once sky-scraping stadium sound, further experimenting with the island sounds and disco grooves that bloated 2013’s Reflektor. Their awkwardness at portraying this livelier mood has not abated; the stilted riddims on “Peter Pan” and “Chemistry” are indistinguishable from some stoned high school kids at their first practice. They’re also lyrically unbearable, trafficking in cliches about romantic chemistry and fairytale escapism. Damn, really makes you think. No intelligent person could deny that cultural shallowness has myriad negative repercussions, but to hear the critique expressed in such simplistic terms—again, “Infinite content / We’re infinitely content”—is particularly embarrassing. It feels so small, for this band once concerned with the highest of the human experience. (“Reflector / connector” is at least an inspired rhyme.) The lyrics to Funeral’s “Wake Up” might have inspired sniggers—“We’re just a million little gods causing rain storms / Turning every good thing to rust,” Butler wimpered and wailed—but the clearness and scope of the band’s vision could not be doubted. Where Everything Now works is when they capitulate to the largeness of their lineup. The title track gives way to a sea-parting choral outpouring; the twee charm of “We Don’t Deserve Love” builds meticulously to an emotional climax; “Put Your Money on Me” is shameless ABBA homage, but at least a well-executed, multi-layered one. There’s even a hint of what the band would’ve sounded like had they more successfully merged their dancefloor ambitions with their mastery of rock drama: “Creature Comfort” sounds like a lost LCD Soundsystem song, the moody Tron synthesizers propping up Butler’s ominous lyric about the perils of fame and vanity. Other people have expressed to me that they hear “Creature Comfort” as an especially patronizing song, in which the band chides a fan who nearly kills herself while listening to Funeral because she can’t bear the idea of not being famous or good-looking. (“She told me she came so close / Filled up the bathtub and put on our first record / Saying God, make me famous / If you can’t just make it painless.”) You idiot, Butler is maybe singing, You heard “Wake Up” and still sided with the Kardashians? To me, the solemnity of his singing, combined with that brooding instrumental and Chassagne’s fever-pitched, arm-hair-raising refrain make “Creature Comfort” the empathetic song the rest of the record might have been. For once, they aren’t pointing a finger, but acknowledging the human tragedy of what’s lost when we get too preoccupied with silly things. Of course, we never used to have to wonder if Arcade Fire were being serious or cynical, kind or condescending. That the purity of their intentions is now up for debate speaks to the particular bummer that Everything Now represents: a once-great band purposely drifting out of touch, and veering off into territories that smarter bands might explore without being such dicks about it. What is this serving but their own sense of self-satisfaction, at having figured out what the norms are still mired in? They should take their own advice, and log off. Correction: An earlier version of this review misstated the lyric from The Suburbs.